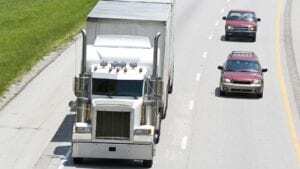 Driving near a semi-truck causes many drivers on the highways to feel frightened and overwhelmed. This is understandable since the commercial vehicle’s massive size and weight can do devastating damage when involved in an accident with smaller automobiles. While it’s easy to feel helpless when facing a semi-truck on the roadways, you have more control over your safety than you think. In fact, the University of Michigan Transportation Research Institute (UMTRI) published a study that found “car drivers were assigned factors in 81% of crashes versus 27% of truck drivers.” In other words, car drivers were found to be the cause of many accidents involving large trucks. There are many reasons a truck collision can happen but there are certain things a truck driver is unable to control. For example, large trucks have immense blind spots, longer stopping distances, and limited maneuverability, making them difficult to operate. For this reason, it is imperative that drivers of small motor vehicles learn to share the roads. Remaining calm and understanding how to drive safely around large trucks such as 18-wheelers, semi-trucks, and tractor-trailers can play a big part in preventing accidents. If you need to pass a truck, make sure to take extra caution and avoid any sudden or reckless actions. Stay far enough behind the truck so you can see the driver in the mirror. This ensures that the truck driver can see your car. Then signal, merge into the left lane, and accelerate in order to quickly and safely pass the truck. Remember to never ride in their blind spot and always pass to the left. It’s important to always keep in mind that it takes trucks a much longer time to come to a stop than other motor vehicles. In fact, “Trucks traveling at 65 mph take up to two football fields to stop,” states the FMCSA. Due to their long stopping distance, you should never cut off a truck. While cutting in front of any vehicle is a bad idea, it is especially dangerous to cut off a truck. If you suddenly move too close in front of one, the driver will likely not be able to see you or have enough time to stop. Similarly, you should never tailgate or follow a truck too closely. This could cause your vehicle to slide or be pushed underneath the truck in the event that you are hit from behind. Additionally, you could suffer serious injuries if you are following the truck in front of you too closely and it blows a tire or loses any hazardous cargo it may be transporting. Semi-trucks need more room to make a turn than smaller, compact automobiles. If a truck swings wide to make a turn and you attempt to squeeze in front of them, you run the risk of being crushed. It can be frustrating to drive near semi-trucks because they take longer to accelerate and, generally, travel at slower speeds than cars. Many commercial vehicles even have ‘speed limiters’ that prevent them from exceeding a set speed limit. However, you should always attempt to be patient and understand that you have to share the road. Honking, passing aggressively, or other signs of road rage often create dangerous situations that can lead to accidents. No matter what vehicle you’re driving, everyone should pay attention to their surroundings, follow the rules of the road, and avoid distracted driving such as texting. While this is legally required of all drivers, there are many reckless individuals on the roads who, unfortunately, ignore safety. For this reason, it is vitally important to drive smart and always be alert to help keep the roads safe. While these safety tips can save lives on the roads, we understand that accidents can still happen. Accidents involving commercial trucks tend to have more severe injuries, greater damages, and higher medical bills. That’s why it’s imperative to know what to do after an accident with a semi-truck. The moments immediately following an accident can be scary and confusing. You should always call the police and emergency medical services to assist with any injuries. The responding officer will evaluate the scene of the accident and take statements from witnesses and/or anyone involved in order to write a detailed police report. If possible, it’s wise to document the scene of the accident yourself as well. For example, take as many pictures of the vehicles, any damage, and your injuries as you are able. Photographs can act as evidence later on, in case something is missed in the police report. 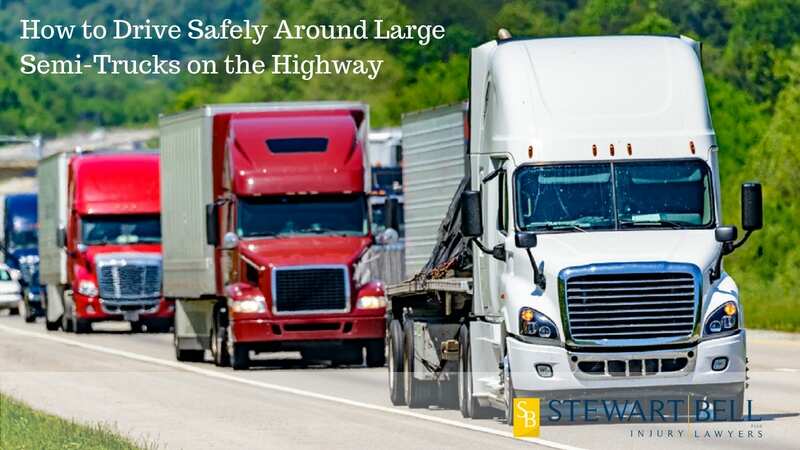 Should you or a loved one decide to take legal action against the truck driver, trucking company, or another third party involved, it is in your best interest to contact an experienced West Virginia truck accident attorney at Stewart Bell to assist you with your case. It can be difficult to determine who is at fault after a semi-truck collision. Furthermore, because of the dangerous nature of their job, truck drivers tend to have much larger insurance policies. However, insurance companies commonly use tactics to attempt to get out of paying large sums of money. With our legal team on your side, you can rest easy knowing your case is in the hands of someone who will fight for what you deserve. If you or a loved one have been in an accident involving a semi-truck or another large commercial vehicle, please don’t wait to contact our law firm today. We have been helping injured West Virginians for more than 30 years and have the resources and knowledge to handle your case. Contact our office today at (304) 345-1700 or fill out our contact form to schedule a free consultation. Our West Virginia truck accident attorneys build strong cases for our clients and are ready to put our advantage to work for you.